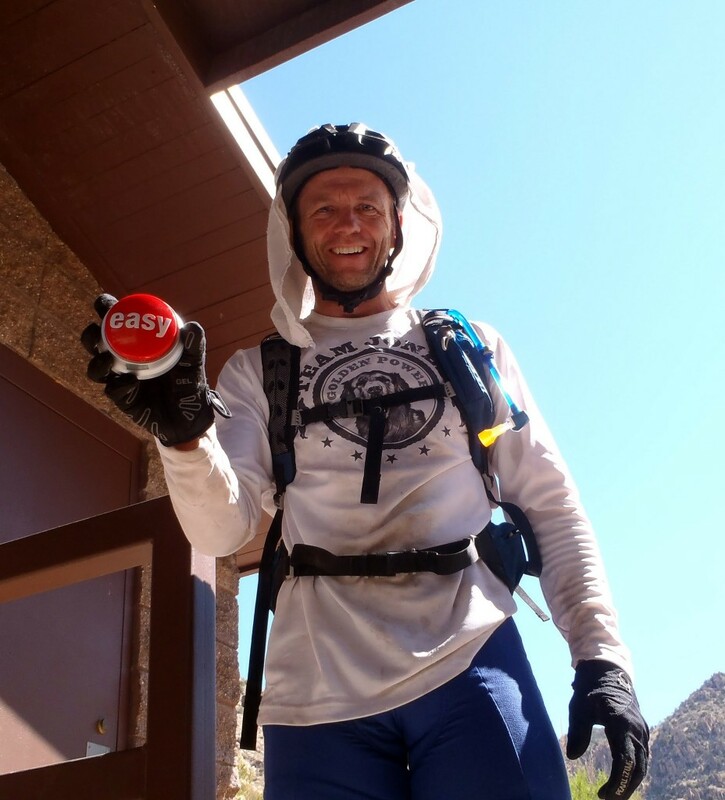 After finishing up a “monster hike-a-bike,” Scott Jones presents the “easy” button he’d been carrying for the occasion. Photo by John Schilling. The stories that have emerged from this year’s Arizona Trail Race are gruesome and beautiful, often at the same time — a man using pliers to pry cholla balls out of his wife’s thighs; doctors surgically removing more than 50 needles from another man’s backside; shoes torn to shreds on a rugged hike-a-bike atop Oracle Ridge; Gila monster sightings; giant insects and creepy cacti; rippling mountain ridges and sunsets that drench the sky in blood light. If the reports serve as any indication, a grand adventure was had by all. And a number of impressive performances emerged in this year’s race. Of the fifty or so riders who started the 300-mile race, 22 have officially finished with a few more still coming in. At least seven have gone on to challenge the 750-mile full distance of the trail, with Tucson rider Max Morris leading the charge. Aaron Gulley took an hour off the men’s record in 2:03:59; Eszter Horanyi shaved 15 hours off the former women’s record in 2:13:15, and was third overall. Pete Basinger arrived an hour ahead of Eszter for second place in 2:12:18. Aaron Boatman (2:17:31) and Dave Wilson (2:21:23) rounded out the top five. Morris said the weather during the first five days of the race was average for April, which is generally favorable for going fast. The third day was the warmest and racers were subject to the worst heat at some of the lower elevations on the route. Nearly half the field dropped from the race; many citing heat or dehydration as reasons they couldn’t continue. Others reported destroyed tires, stomach issues, too much hike-a-bike, boredom, and lack of drive as their reasons for scratching. 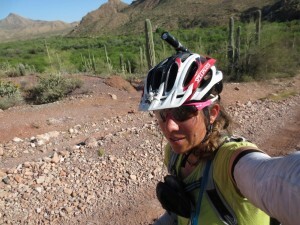 Self-portrait by Eszter Horanyi during her record run in the Arizona Trail 300-mile race. 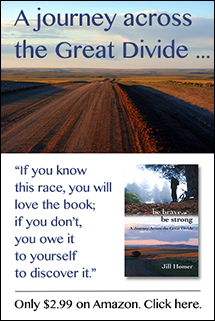 Still, beautiful photos and awestruck recollections of beauty outnumber the tales of woe from this year’s race. Congrats to everyone who finished this year. The 750-mile race is still going on and can be tracked at http://trackleaders.com/aztr13.